The month of November is a great month for writers—especially mystery writers. First, it’s National Novel Writing Month–NaNoWriMo-the event that challenges people to let go of their inner editor and write a 50,000 rough draft novel in 30 days. Second, November 15 is the deadline for the Malice Domestic Grants competition—the writer’s grant for unpublished writers who are working on a traditional mystery novel. Let’s start with NaNoWriMo. If you’re a writer who doesn’t believe the hype, perhaps my story will be of interest. Like many people, I’ve always loved to write, but didn’t prioritize it in my life. Bursting with ideas, I started writing many things, but never finished any of them. Why was it so hard to finish? Because I knew what I was writing wasn’t any good yet. I felt I needed to edit as I went, maybe take a break to do some research, or attend a writing workshop…. These were all valid concerns—a writer does need to edit, research, and learn the craft of writing. However, it’s all too easy to get wrapped up in an idea of perfection that’s counterproductive. If you don’t have a completed draft of a manuscript, it’s pretty damn hard to make it better. Somewhere in my mind I always knew this, but I couldn’t get to that ending. NaNoWriMo was the thing that got me to type “the end” for the first time. In other words, NaNoWriMo can be a great help to those of us who have trouble letting go of our inner editor. The essence of the challenge is let your imagination run free without looking back. Sure, a lot of what you write won’t be any good, but you’ll come up with clever ideas and beautiful phrases that you never would have had if you were worried about your words being perfect. That novel I wrote for NaNoWriMo is the book that became my debut mystery novel, Artifact. Once I finished that draft, I attended workshops to learn more about the craft of writing. With the bare bones of a story that NaNoWriMo helped me achieve, I was able to revise the story into something I was excited about. A traditional mystery about a historian who travels from San Francisco to the Highlands of Scotland to find a long-lost treasure from India, I thought Artifact might be a good fit for the Malice Domestic Grants program. I was surprised to find out I was right: I won. And winning a Malice Domestic Grant was the thing that got me to take my writing seriously as well as catch the attention of literary agents. The grant provides $1,500 to help you attend a writer’s conference to learn the craft of writing and finish revising your manuscript. More than the financial aspect, the grant is well regarded in the mystery publishing community, so it can help you stand out to agents and editors. If you’re working on a traditional mystery, I strongly encourage you to apply. This year’s deadline is November 15, and details about what to submit are on the Malice Domestic website. Gigi Pandian is a mystery writer, photographer, and graphic designer in the San Francisco Bay Area. She grew up being dragged around the world by her anthropologist parents. She tried to escape her fate when she left a PhD program for art school, but adventurous academic characters wouldn’t stay out of her head, so she began writing the Jaya Jones Treasure Hunt mystery series. 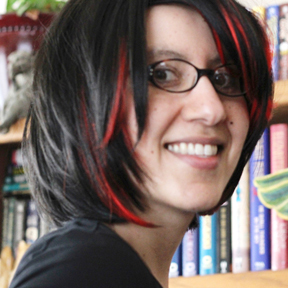 Gigi was awarded a Malice Domestic Grant for her debut mystery novel, Artifact, which was released August 28, 2012. Gigi’s novella Fool’s Gold, a prequel to Artifact, comes out December 3 in Other People’s Baggage. To sign up for Gigi’s newsletter or connect with her on Facebook or Twitter, visit http://gigipandian.com/. This entry was tagged Gigi Pandian, grants, Malice Domestic, NaNoWriMo. Bookmark the permalink. Gigi, thank you for sharing your experiences and wisdom. ARTIFACT is a terrific read, so I’m looking forward to FOOL’S GOLD! Thanks for this post Gigi. You are a real inspiration. I can’t get anything done without a deadline, so I’m shooting for finishing my novel by next summer in hopes of sending it in for the Malice Domestic grant. I would do NaNoWriMo if it were in another month than November or if I were still single. Too much going on for busy moms this month. Thanks for promoting the William F. Deeck-Malice Domestic Grants for Unpublished Writers. The Malice Domestic Board of Directors is very proud of this program and I’m thrilled to serve as Chair of the Grants Committee. Malena — I can’t work without a deadline either! That’s why NaNoWriMo was such a great way for me to finish ARTIFACT! And FYI there’s an offshoot of NaNoWriMo that lets you get support for doing the month-long challenge all year round. Harriette — It was so wonderful getting my introduction to the world of mystery writers and mystery conventions through the work the grants committee does! Thank you all.